Maggie Thornton Renfro will be 115 in November. She is the 7th oldest in the world. 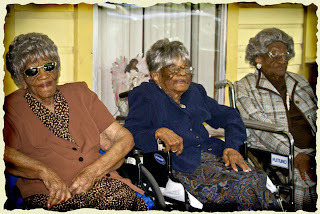 Her life will be celebrated alongside her three sister, Carrie, 107, and Rosie Thornton, 103. Maggie Mae Thornton Renfro spends her days singing. The 114 year old lived by herself until she was 106 years old, then adopted daughter Mattie Ellis moved in, helping with day to day chores like cooking breakfast.